I must admit to a fixation on flashlights and EDC stuff. My definition of EDC though is a highly-personal one - if it can't fit into my pants or shorts pockets, it's not for me. Logic behind it is straightforward, if I can't bring it without a backpack or bag, it's kinda useless for me. I'm admittedly a convert to Nitecore as their flashlights are reasonably-priced and looks/feels like they're made to last. The Tube is no different though it departs from the Nitecore convention of using CNC machined aluminium. 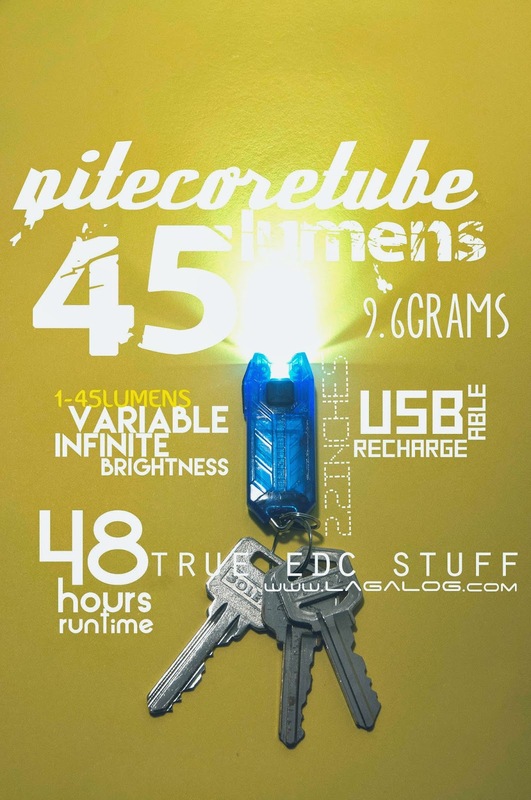 Instead, this 45 lumen torch is made from polycarbonate. Sure, there are a lot of keychain lights out there but the pain of looking for those itty-bitty button cell batteries make them kinda impractical; ditto the short runtime and the expense in the long run. • I just wished Nitecore recessed the button a bit deeper so it wouldn't turn on unintentionally inside my pocket or wallet (Yes, it fits into a wallet). Unlike the other Nitecore flashlights where you can twist the head a bit loosely to avoid this from happening, the tube is a one-piece thingamajig. Save for the rubber seal covering the USB port, there's no other opening into the mechanism inside. • An aluminium Tube can be cool. With an improved USB port cover, it be fully submersible. I got mine (and some for gifts - they make really cool and useful gifts) at the Tactical Asia online store; retail price: P500; colors available: clear,olive, black, blue, pink. They carry other great Nitecore and EDC thingamajigs so it's tempting to browse the other stuff. So be warned.